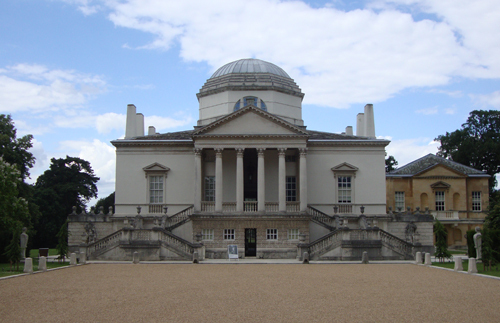 This week’s local history topic for Hayes FM radio station was Chiswick House. Located between the Hogarth Roundabout and Chiswick Bridge, it was for almost 200 years in the possession of the Dukes of Devonshire until surplus to requirements, they offloaded it early last century, leaving local authorities scratching their heads as to what to do with it. Demolition was a very real option. In the 1950s, the Georgian Group and others pressed for restoration to its original specification. More recently, the gardens have benefitted from a National Lottery-supported £10 million overhaul by the Chiswick House and Gardens Trust, founded in 2005 for the purpose. The project was completed last October. So now this architecturally highly-significant early-Georgian villa, run by English Heritage, is as close as can be to its condition when built in 1729. 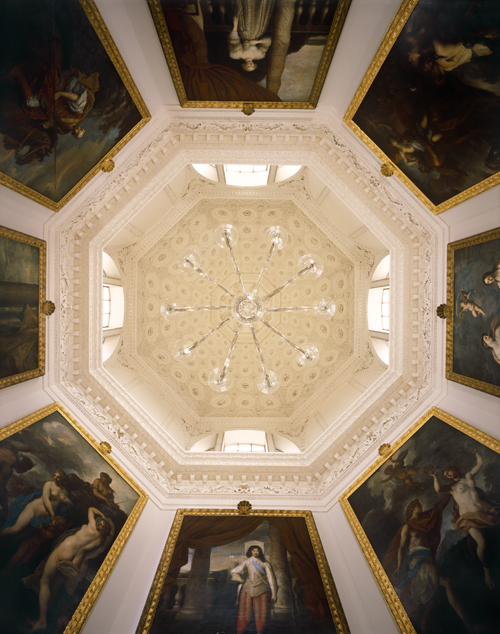 The house was designed by its owner the 3rd Earl of Burlington. His protégé William Kent – who later became a prodigious architect in his own right – did the interiors and also developed the entire garden. This was towards the end of a period when for over fifty years the English Baroque of Wren, Hawkmoor, Vanbrugh, Gibbs and the like held sway. Burlington, who had taken no fewer than three Grand Tours to Italy, was determined to change all this, starting with Chiswick. Imbued with the ideas of Palladio (and many others, it must be emphasised), he determined that Chiswick would be as near as a classical Roman villa as it was possible to be. The structure of the building, its dome, its rooms, its decoration, fittings and furniture are highly symmetrical, ordered, proportioned. It was to represent the Augustan Age, to Burlington and his circle the high water-mark of Western civilisation and its purpose to influence a new Augustan age in England. More than a building, it was also a showcase of English intellectualism. The interior of Chiswick House deeply interesting and lavish. The ground floor is low ceilinged and functional. The action is mostly on the first floor. The central space – the Tribunal – is a domed octagon. 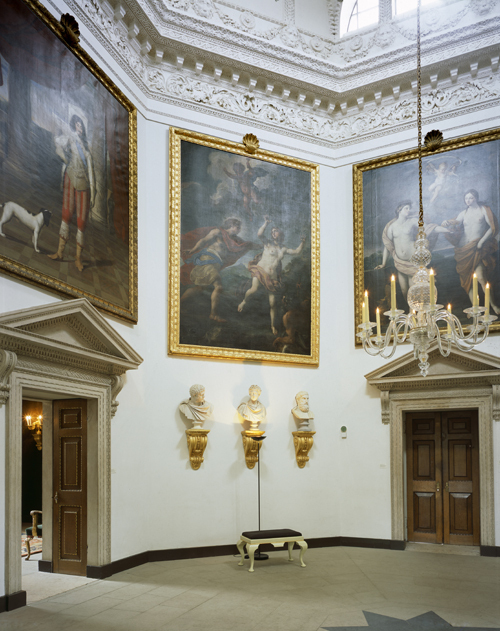 Each of its eight faces displays large paintings – portraits of Charles I and II and other Stuart dynasty worthies. More on that shortly. 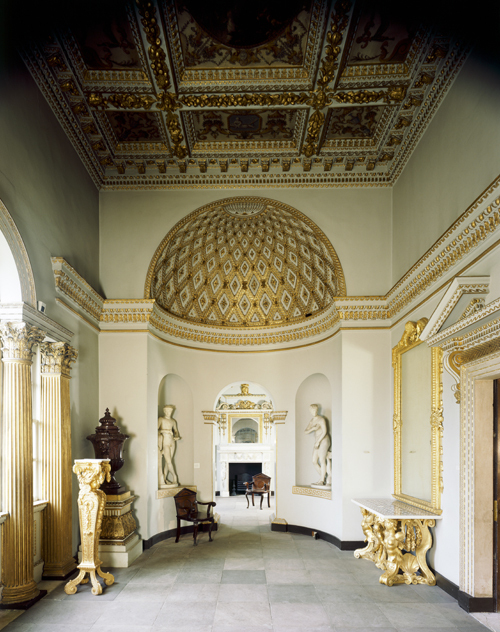 Extending outwards from the tribunal are the other rooms, all of which are shaped strictly on classical forms. The decor and furnishings are likewise based on classical themes, most notably nautical: shells, fish scales, Venus and other sea gods. 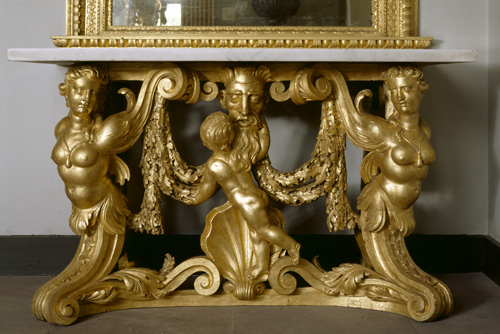 Statues, stone vases, portrain busts, pedestals and guilded chairs and tables abound. The Tribunal. © Jeremy Young. Source: English Heritage Photo Library. The whole building is dripping with classical symbolism. But what’s this? Thistle motifs. Burlington was ostensibly a good Whig who supported the nascent Hanoverian dynasty. But many of his friends were Catholic intellectuals and writers (e.g. Alexander Pope). It is known that Burlington impoverished himself with his building schemes and it has been a long-standing mystery as to how he kept going. Recent scholarship – ongoing – suggests that he was being supported financially by the Young Pretender and that their relationship much closer than hitherto suspected. So Burlington was playing a dangerous game. So his villa was both an homage to Augustus and to the Stuarts, whom he secretly considered the rightful monarchs of Britain. (UPDATE: 6/7/11: I haven’t got this part right at all. Please see Ricky Pound’s clarification in the comments). Through most of the 19th Century the Devonshires rented Chiswick House out. For some decades around the turn of the 20th Century, it was adapted as a hospital for the mentally ill before the family eventually sold it off. You may be interested in architecture, history, interiors, painting, sculpture or gardening. Or perhaps you just appreciate the finer things in life. Whatever the case, Chiswick House will do it for you. QI Fact: William Hogarth was a close neighbour of Burlington’s in Chiswick. Although he was obliged to get on with the Earl (they were both closely involved in the Foundling Hospital, for example), he despised neo-classicism as being un-English and therefore unpatriotic. He hated Kent. 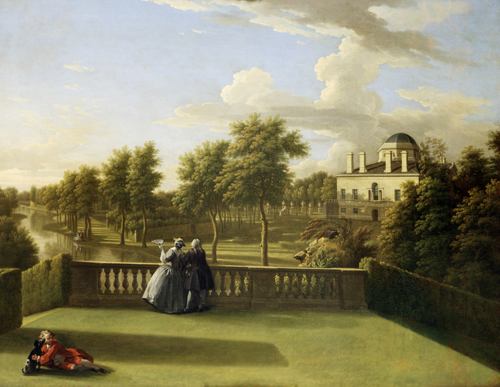 When invited to paint the figures in a picture of Chiswick House, he impishly depicted them looking away from the building. QI Fact ii: Joseph Paxton, creator of the Crystal Palace was talent spotted by the 6th Duke of Devonshire while working in the gardens at Chiswick. Chiswick House Gardens are open year round and entrance is free. The house is open from March until October on Monday, Tuesday, Wednesday and Sunday. Entrance is £5.50, very reasonable in comparison with many similar attractions. Special thanks to Ricky Pound of English Heritage for generously sharing his massive knowledge on the house and its contents and on Burlington and Kent. “Burlington was ostensibly a good Whig who supported the nascent Hanoverian dynasty. But many of his friends were Catholic intellectuals and writers….. Recent scholarship suggests that he was being supported financially by the Young Pretender and that their relationship much closer than hitherto suspected”. Richard Boyle (1694–1753) was not too old to have a relationship with Bonnie Prince Charlie (1720–1788) I suppose, but it strikes me as an unlikely friendship. On religious, political and aesthetic grounds. Where would they have even met and collaborated? Understand what collaboration they had would have been by correspondence. What I wrote here is from lengthy conversation with above mentioned Ricky Pound last Wednesday, my knowledge is lacking and time a bit limited for a deeper dive. I shall see if I can get Ricky to comment. As far as I remember the main purpose of Chiswick House was simply for parties and such entertainment and Kent designed it with kitchens but without bedrooms, is that correct? Most certainly a party venue but also a showpiece, I think, and definitely no bedrooms, but there was always accommodation on site. Originally, a Jacobean period house nearby. Then, in the 1780s or thereabouts, the Devonshires demolished this, but added two wings to Chiswick House itself, the idea being, I guess that revellers could still have a place to kip rather than have to take a coach back to town. These wings were demolished in the 1950s. The foundations of the Jacobean house were uncovered by archaeologists very recently, then covered back up. Both Charles James Fox and George Canning actually died at the house in the early 19C. So glad you mentioned. My thoughts *exactly*. They look bizarre, like a proto-Battersea Power Station. Meant to say in the piece, but slipped my mind. Mike Paterson was mistaken when he stated that Lord Burlington may have been financially supported by Charles Edward Stuart. However, it is possible that Lord Burlington’s substantial fortune disappeared because it was being loaned to the exiled Stuart Court. It is known, for example, that when on his Grand Tours Lord Burlington travelled under the alias of ‘Mr Buck’; a proven Jacobite cypher name. Lord Burlington’s name also appeared on a secret list drawn up in 1743 by James Butler of English aristocrats willing to see the envisaged restoration of the House of Stuart as rightful rulers of Britain. The historian Jane Clark has gone as far to suggest that Lord Burlington (and his father) received earlier Garters from the ‘Kings over water’ and Burlington may have been present at the marriage of Maria Clementina Sobieska to King James III which took place at Montefiascone on 1st September 1719. As the Jacobite scholar Edward Corp summarises the situation: “there is now enough evidence available to suggest that Lord Burlington can no longer be regarded as the embodiment of the Whig ideal. Too many circumstances point to his having had Jacobite connections, directly when travelling on the Continent, through his freemasonry, through his cousin Lord Orrey, through Bishop Atterbury, through Dr Drake (the Jacobite historian of York), and via servants such as his chaplain Aaron Thompson or his agent Andrew Crotty”. On another subject, the chimneys at Chiswick were designed as obelisks to give the villa a sense of the ancient. The obelisks fitted into the general Augustan/Egyptian theme of Chiswick as the Emperor Augustus was the first Roman ruler to transport obelisks, sphinxes and stone lions from Egypt and erect them in Rome. Thanks for that clarification, Ricky, I misremembered some key points on the intrigue side of things. Intriguing! Entrance is free with an Art Fund membership card! I’ll be visiting Chiswick House with fresher eyes this summer. Thanks for the info. Can you please add the below link to the links section please as it should take you to the Chiswick House and Gardens Wikipedia site which I have been building over the last two years. Is is not yet complete but does provide a host of extra information and a comprehensive reading list on the subject. Hi Ricky, it’s already there. Would you like me to make it more explicit? And now I know why it’s so good! Once I find the time I will complete the missing footnotes to the Wikipedia article and hopefully make it a really useful document for people wanting to learn more about the Villa and gardens at Chiswick! Great wiki article, I have a paper coming on Chiswick soon, it will be really useful. Ricky is very seldom mistaken, but I don’t say Burlington may have been present at the marriage of Maria Clementina Sobieska to King James III which took place at Montefiascone on 1st September 1719. He was not in Italy soon enough to attend the wedding. But I do say it is likely that he visited him in Rome shortly after when on his second Grand Tour. Not at all, you’re welcome, and thank you. If it brings your readers here, that’s fine with me! correction Edensor was moved by the unmarried 6th Duke…. I’d be most interested in hearing from anyone who knows anything about the relationship between Chiswick House and Freemasonry in the early 19th century. If you can help, please get in touch. Ricky Pound is your man for this sort of thing. He doesn’t work at Chiswick House anymore but you can contact him either via Orleans House or Turner’s House, or look him up on Twitter @ricky27704102 . Thanks for the fast response. I’m not on Twitter but I can try the other leads. I’ve just noticed that Ricky himself has commented on this post before. I’ll send him a note to have a look at your comment. Thanks, Ricky. What I’m specifically interested in is the period between about 1820 and 1830. Has anything been published that looks at that era?